Phil has served the building industry for 33 years with national, state and local organizations. 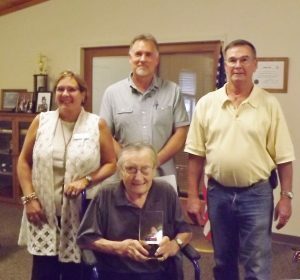 Georgia High Country Builders Association presented Phil with an engraved award. In addition, the National Association of Home Builders and Home Builders Association of Georgia presented proclamations recognizing Phil for his many years of service. Kelly Lass, Ex VP, HBAG, Devell Frady, Pres. GHCBA and Don Murray, EO, GHCBA, present awards to Phil Forest.